Hi, I am a 5th Degree Black Belt in Tae Kwon-Do. I first started training in martial arts back in 1991 in a free style Tae Kwon-Do club. This was a mix of Tae Kwon-Do, Kung-Fu, Kick-Boxing and Boxing with other stuff thrown in. I trained for three years in this and achieved my Blue Belt. I left when the club became more Kick-Boxing orientated, to follow a more traditional style of Tae Kwon-Do, and joined the T.A.G.B. under Mr Mark Farnham. This offered me more challenges and interested me further, especially with all the patterns and techniques there were to learn. 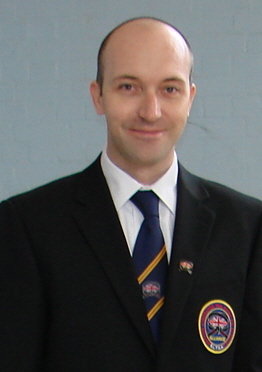 I started teaching Tae Kwon-Do in June 1998 at the Bury St Edmunds Club, under Mr Farnham. On the 8th January 2002 Haverhill Club was started and by March 2004 Newmarket Club was up and running. I soon realised that teaching was what I enjoyed most and started to take steps towards doing this full time. On the 15th of August 2006 I finally took full control of Haverhill School, thus it became the first of the B.L. TAE KWON-DO SCHOOLS. In the January of 2011, after growing to 6 schools and over 200 members, it was decided by the senior instructors that we should leave the TAGB and become Independent. This would enable us to be in control of everything we do and offer our students a better service all round. The BLTSA was formed to offer other groups that want to join a non-political alliance, a place to go, help with insurance and any other requirements to run their school effectively etc. 'The only way is up' they say, so up is where we are going!! I hope to pass my knowledge on to many more students for years to come, and see them grow with Tae Kwon-Do like I have. To enjoy its benefits and also pass on their knowledge to others. Me breaking with a right reverse knife hand at the GTI British Championships 2017. This is one of the 5 breaks required to win the Gold medal.